This concluding chapter summarizes the decade 2007–2016 through the 14 selected activities. It reviews the achievements, shortcomings or failures of the United Nations and UN Secretary-General Ban Ki-moon’s role. The chapter indicates Ban Ki-moon’s disappointments and accomplishments. 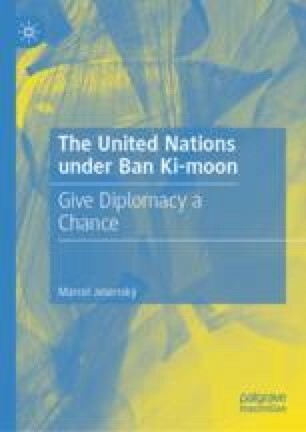 The chapter identifies Ban Ki-moon as a responsible and accomplished managerial Secretary, more Secretary than a General, fully aware and respectful of the contextual constraints set up by the Member States. Overall, the United Nations under his watch continued to deliver results, although sometimes progress has been too slow and uneven. The Organization and its Secretary-General have much work still to do, and they need to do more and to do it better to prevent the Organization to slip to the sidelines of international politics.